Of all the states and nations of Citadel, seven stand out as the powers to be reckoned with. Each represents a dramatically different worldview and culture, and conflict between them is an ongoing and inevitable product of this. 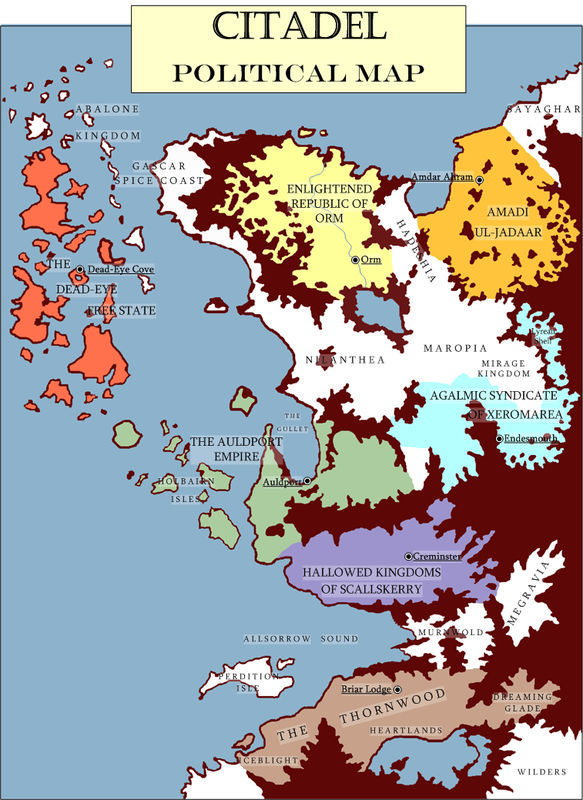 The known world of Citadel and its political divisions. This week, we take a look at the three “Southern” states of the world: The Auldport Empire, the Hallowed Kingdoms and the Thornwood. The great engine of civilization and progress, Auldport prides itself on its technological and naval supremacy. Though old enough to be an established nation with many long and proud traditions, Auldport is still radically expansionist in philosophy, insatiable for new territories and colonies. Auldport began as “The Duchy of Thaxtershot”, a remote territory of the Hallowed Kingdoms of Scallskerry. During the Second Ravening War some 140 years ago, the Kingdoms were beset by a terrible invasion. The Founder’s Council of Auldport took its cue to rebel and was able to stage a largely bloodless coup. What little loyalist resistance could not be bought by the Council’s deep pockets was swiftly dealt with by the newly formed Mechanomancer Corps. Mechanomancer Sia Verne rallies her troops while her shard cannon builds steam. The mechanomancers used a combination of firearms, star-powered devices and engineering brilliance to bring their enemies to their knees. After the successful rebellion, mechanomantic technology was used to industrialize Auldport and give it a production capacity to rival even Orm. The mechanomancer soldier would go on to become the great icon of Auldport’s power, at least until they were overshadowed by Auldport’s yet more terrifying “Shell Pilots” - mechanomantic armour specialists of a higher order. Geographically, Auldport’s position could barely be more advantageous. Nestled in the spacious, defensible bay referred to as The Gullet, the city and its military shipyards are located at the crossroads of Citadel’s trade. Indeed, many view Auldport as the beating heart of the world’s shipping lanes. Enduring, devout and noble, the Hallowed Kingdoms of Scallskerry have withstood the test of time. Through the ravages of two major invasions and numerous rebellions, the Heirophant of Creminster and the College of Deacons have preserved order against all odds. Staid, stuffy and very traditional, the Kingdoms are to some a symbol of fortitude and integrity, yet to others a symbol of stasis and oppression. Two and a half centuries ago, the Kingdoms were forged in the darkness of the First Ravening War. Laird Donnart, unifier of the Barhem clans, delivered the lands from the brink of doom and was instrumental in the formation of the Chanter tradition. He also became the first Stone Sentinel, a being transformed through potent Chanter prayers into a deathless warrior with flesh as hard as marble. Under Donnart’s leadership, the Kingdoms were extended West and North to Auldport and beyond, as well as occupying the Southern provinces now known as Byreford and Wakestrath. Today, Donnart’s legacy takes the form of the four Hallowed Kingdoms, a feudal oligarchy administered by a Heirophant and a College of Deacons. The Orthodoxy unites the four kingdoms (Granally, Wormeshire, Barhem and Ulver) under the banner of the Xolist faith. Together they stand as the barrier of order against the dual threats of the flesh-hungry giants to the East and the creeping chaos of the Thornwood to the south. Many miles to the South of the Hallowed Kingdoms, sprawls the ancient and enigmatic forest known as the Thornwood. In times past, it was regarded with little but fear and superstition. It was the forest at world’s end, steeped in its perpetual veil of fog and teeming with strange creatures. Then, some 30 years ago, people started to emerge from the Thornwood. Of course, the term “people” was not one used at the time by the startled settlers of Wakestrath and Byreford. These were a strange, exuberant, hardy, amnesiac folk who seemed as much plant as human. The name “tanglefolk” was given, and it persists to this day. Opinions vary as to whether the Thornwood can, in fact, be classified as a nation. The “gangs” of Thornwood are what passes for government there, sweeping collections of roughly-matched ideals. The mysterious “Proxy”, elected through unknown means to serve a term of seemingly random length, is what passes for a national leader. They have no real army, though when threatened, the Thornwood is known to respond with militia-like “Redpaw Gangs”, and in the most dire situations, the terrifying Flux Witches. The Thornwood has its own culture, slapdash though it may be. It also welcomes non-tanglefolk into the civilization even if the outsiders’ motives are less than certain. Most importantly, though, the Thornwood is spreading. Slums run by Thornwood gangs are now commonplace in cities around Citadel. There are even Thornwood “colonies”, characterized by enormous encircling briar patches, as far north as the Paan delta. Though tolerated in most of these places, there are people who feel that the Thornwood itself spreads like a blight and threatens to engulf all other civilizations. Be sure to check in next week for Part 2, wherein you will read about the exotic, alluring and wildly dangerous Northern nations!